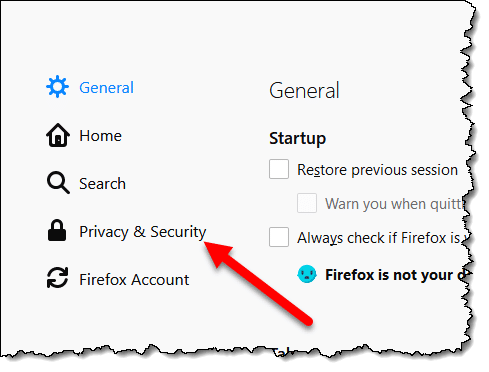 How Do I Clear the Browser Cache in Mozilla Firefox? - Ask Leo! It's fairly easy to clear Mozilla Firefox's cache. Here's how... and why you might want to. Mozilla’s Firefox has long been a popular alternative browser. Like every browser, Firefox has a cache, and sometimes that cache can get “confused”. Clearing the browser cache is the fastest way to un-confuse it. Type CTRL+SHIFT+Del to go directly to the Clear History dialog, below. Alternately, you can locate the dialog by clicking on the “hamburger menu” in the upper right and then clicking on Options. Menu in Firefox showing the Options item. On the left side of the resulting page, click on Privacy & Security. Privacy & Security link in Firefox options. Scroll down to find the “History” section, and click on Clear History…. Clear History button in Firefox options. 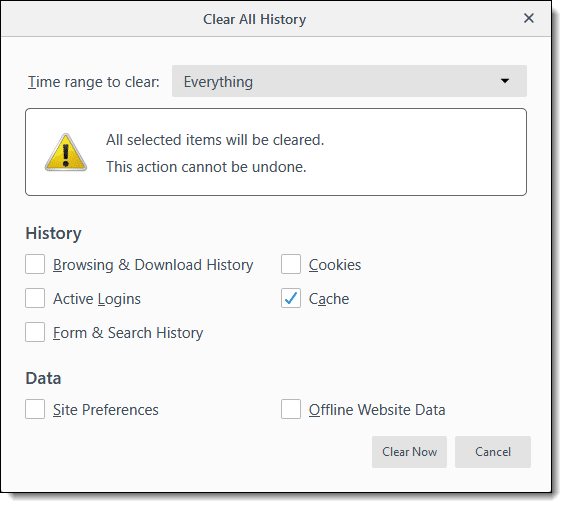 In the resulting Clear History dialog, make sure that the “Time range to clear:” selection is set to “Everything”, and that the “Cache” item is checked. You can include other items if you like. Mozilla Firefox’s cache has been cleared. What’s a cache, and why does it exist? Find out more in What’s a Browser Cache? How Do I Clear It? Why Would I Want to? You generally won’t need to clear Firefox’s cache. When all is working properly, Firefox manages the cache, making room as needed. Clearing Mozilla Firefox’s cache is a diagnostic tool you might use when things don’t seem to be working properly. For example, if pages aren’t displaying properly, or entirely, or just seem excessively slow, or otherwise broken, clearing the browser cache is an easy first step. It harms nothing and might fix things. Since the cache is a speed optimization, the only side effect of clearing it might be a temporary performance hit: pages might take just a little longer to load the first time you visit them after the cache has been cleared. What’s a Browser Cache? How Do I Clear It? Why Would I Want To? - "Clear your browser cache" is the first response tech people give when you encounter webpage problems. We'll look at why that is and how to clear the cache. « Previous post: How Do I Clear The Browser Cache in Microsoft Edge?